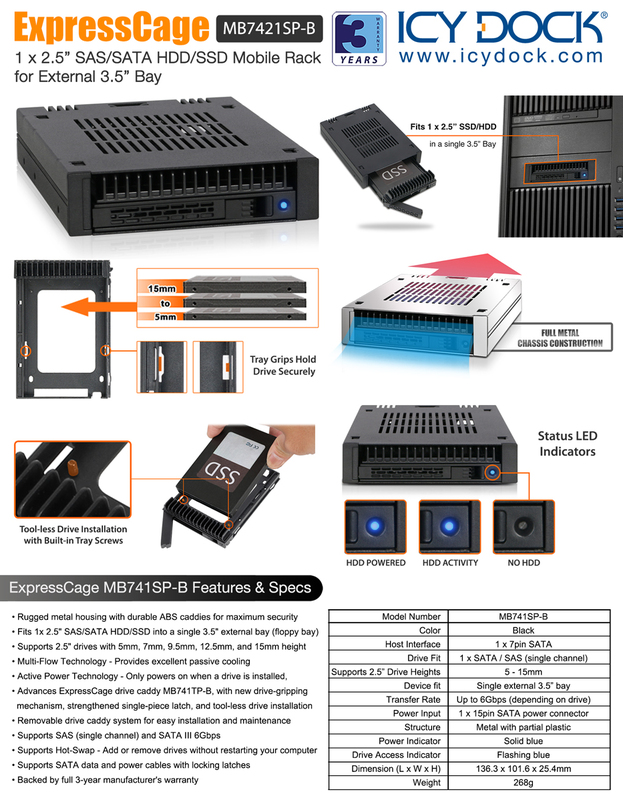 Introducing the ExpressCage MB741SP-B, a single-bay hot-swap enclosure for any 2.5" SATA/SAS hard drive or SSD for the 3.5" external bay (Floppy bay). 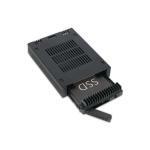 With the rising popularity of small-form-factor (SFF) and portable computing systems, there is a need for convenient and secure access to data storage devices utilizing smaller bays. To answer this, the new ExpressTray drive caddy supports completely tool-less drive installation, without sacrificing security, with its enhanced screw-less drive gripping mechanism, stabilized drive insertion design, and single-piece latch. Furthermore, the strong metal chassis provides protection against bumps and shock, while the integrated air ventilation holes work to keep your drives running cool all day, even under heavy load. 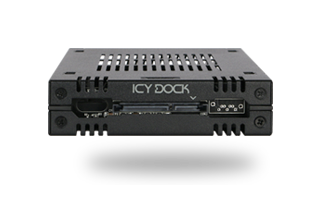 Utilizing the small space of the external 3.5" drive bay (floppy bay), the MB741SP-B is perfect for applications where space is limited. 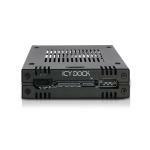 Small-Form-Factor PCs, embedded systems, box PCs, in-vehicle systems, and home servers can all benefit from this compact 2.5" SAS/SATA drive enclosure. The front-accessible bay makes it easy to add or remove a drive for installation, upgrades, and maintenance. The newly designed ExpressTray MB741TP-B is designed for applications where regular drive hot-swap is required, while providing security and durability, fit for enterprise applications. 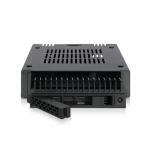 Grips on the sides of the caddy hold your drives securely, to keep your sensitive data safe. 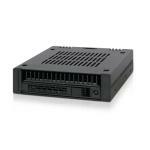 Because it supports full 15mm height drives, the ExpressCage MB741SP-B is compatible with nearly all 2.5" SAS (single channel) drives and data center / NAS drives, including the Seagate Enterprise Nytro, EXOS, and Ironwolf, WD Red and Ultrastar, HP Enterprise (HPE), Toshiba Enterprise, and all other enterprise grade drives. The unique built-in screws allow for entirely tool-less drive installation and removal, to allow for quick and easy swapping of drives. 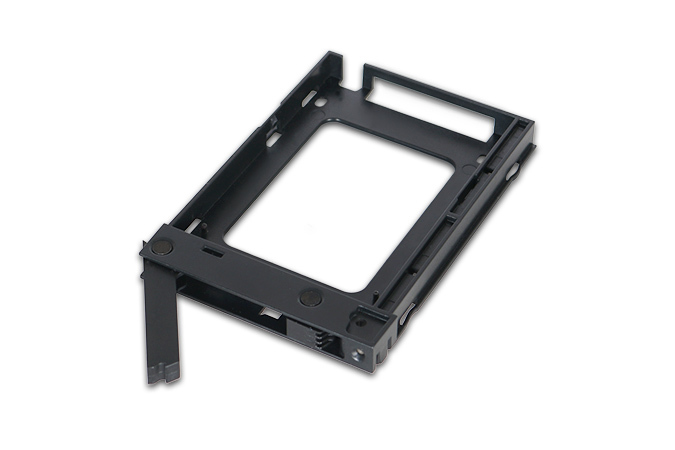 In addition, for applications that require extra stability, we have provided the optional bottom screw holes with included screws, so you can hold your drives even more securely. The strong, single-piece latch pops out with the press of a button, making it easy to remove your drives. The integrated drive activity light shines solid blue when powered, and flashes blue when the drive is in use, so you know when it's safe to remove your drives. We understand that the first priority for any storage enclosure must be security of your data. 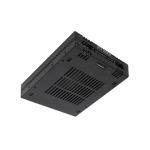 That's why the MB741SP-B uses a metal enclosure for maximum protection from bumps and drops. The heat-dissipating properties of the enclosure, combined with the amply placed ventilation holes, keeps your drive running cool all day, even under heavy load. 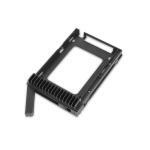 The ExpressCage MB741SP-B supports both 7-pin SATA data and 15-pin SATA power cables with locking latches, so you'll never need to worry about cables unintentionally disconnecting from your enclosure. Once these cables are connected, they'll lock into place and stay that way.